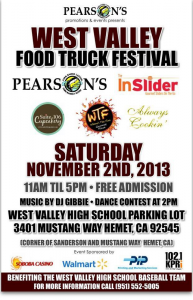 Food truck hunters should head to Riverside County tomorrow (November 2) to get their fix. Two events are taking place — one in Riverside and the other in Hemet. California Baptist University’s Homecoming Block Party will feature ten trucks, while Hemet’s West Valley High School’s truck fest will see half that number. The Cal Baptist event will take place from 11 a.m. to 5 p.m. on the campus’ front lawn. In addition to the food trucks, there will be games, inflatables, a petting zoo and music performances. Cal Baptist is at 8432 Magnolia Ave., Riverside. For more information, click here. 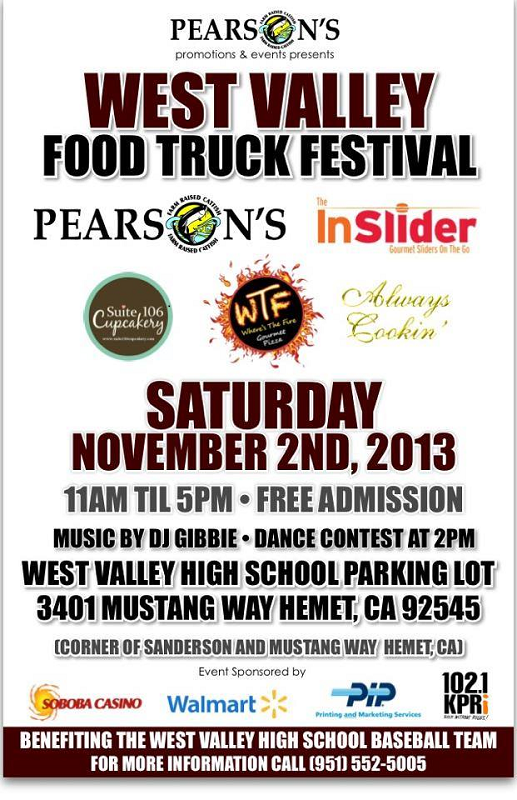 The West Valley High School Food Truck Festival will also be held from 11 a.m. to 5 p.m., but in the West Valley High School parking lot, 3401 Mustang Way, Hemet. Proceeds from the event will benefit the West Valley High School’s baseball team. Go Mustangs! This entry was posted in Hemet, Riverside and tagged fundraisers by John Plessel. Bookmark the permalink.